For the past couple months, I've been reading a fabulous book. 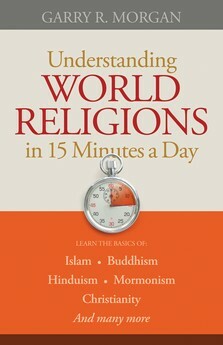 Understanding World Religions in 15 Minutes a Day by Garry R. Morgan teaches the basics of all the world's major religions in nice little bite-sized pieces. Clearly, since it is in "15 minutes a day" we are not talking hugely comprehensive here. This isn't a seminary-level comparative religions course or anything. But Morgan packs a lot of information into a few pages. What religions are represented in your neighborhood, your workplace, and your children's school? Things seem to be changing every day, and it can be hard to keep up. You may know a little about some of these religions. Others are new to you. You'd like to learn about them and how they differ from your beliefs, but who has time to do all the research? Forty readings, fifteen-ish minutes a day (none took me that long) and you can have a basic background in world religion. Many religions have a single chapter, including Zoroastrianism, Jainism, Taoism, and Shinto. Other religions include multiple chapters. Judaism, for instance, has two: Historical Development, and Today. Buddhism has three chapters for three different types: Theravada, Mahayana and Tibetan. Islam is by far the largest with six chapters. A few years ago, we studied a lot of these religions as part of our Eastern Hemisphere studies. I was working primarily with my 6th and 4th grade students on the religion part of that. I really do wish I had this book in my hands at that point. It is concise, and the tone is respectful. I think this is something I could have used with my kids at that point.